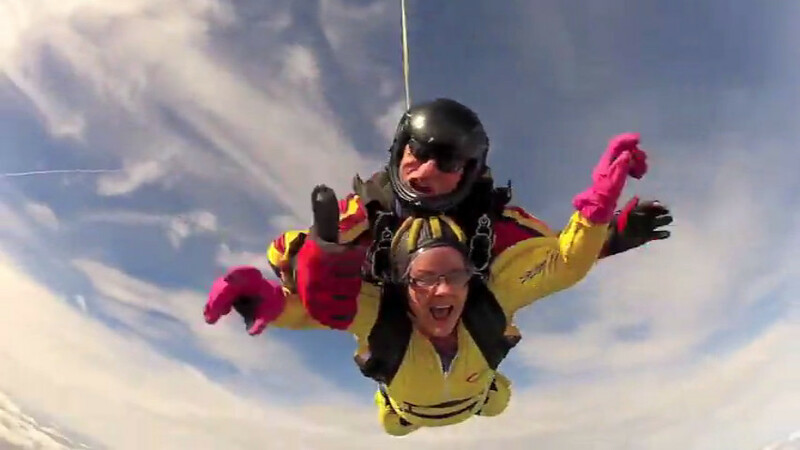 An adrenaline rush from 7,000 feet! Experience a different type of tandem where you exit from a lower altitude of 7,000 feet instead of our usual 12,000 feet. A popular choice for on a budget for those wishing to try before embarking on the higher tandem. 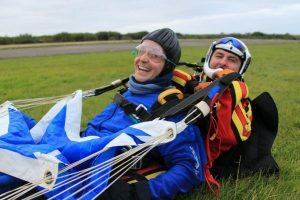 Training is to the same high standard as our regular tandem skydives. On arrival at the parachute centre your tandem instructor will take you through all you need know to make the jump safely. 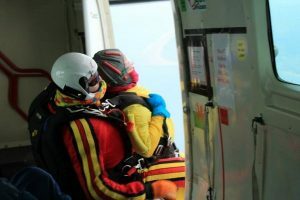 This will include the equipment to be used, aircraft orientation as well as covering what you can expect in freefall and finally the position you need to adopt for landing. This briefing and training generally takes 30 minutes and the instructor will be pleased to answer any questions you may have. 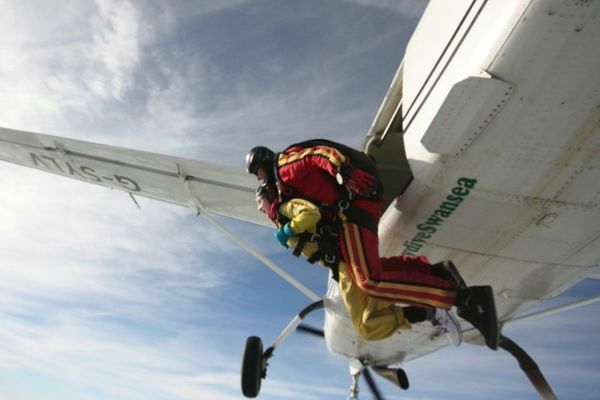 For your skydive you will be provided with a jump suit, gloves, goggles and headgear. Next you will be fitted into your harness by your instructor. Once inside the aircraft you will be attached to your instructor. You will still experience that huge rush of adrenaline as you see the door open at 7,000 feet and you move towards the edge of the aircraft. Momentarily suspended outside before you exit. Your instructor will deploy the parachute within seconds and by about 5,000 feet you’ll be under a Ram Air Tandem Parachute spiraling through the sky. The parachute has dual controls and you can aid the instructor in steering the parachute to make the most of the stunning views over the Gower peninsula. Your instructor will take complete control of the landing after about 5 minutes, guaranteed to take your breath away! 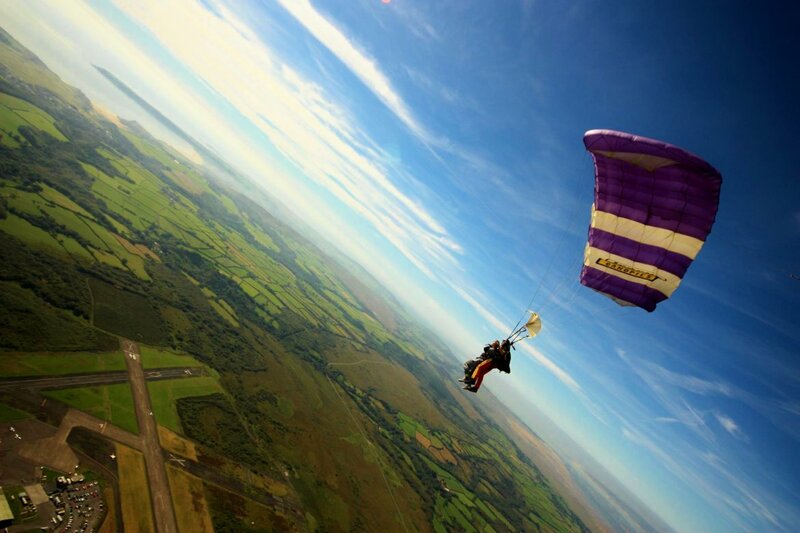 To commemorate your skydive experience you’ll also be presented with a certificate of achievement. 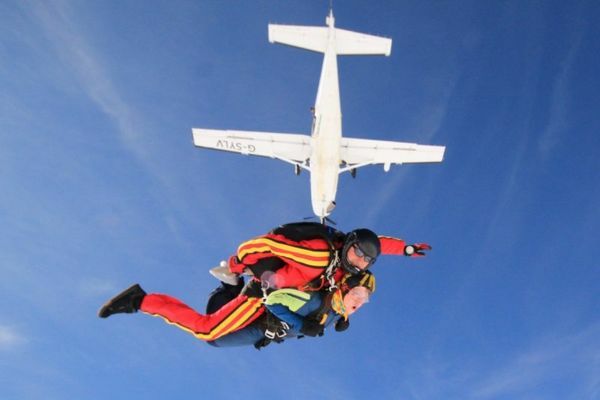 The cost for the Ground Rush skydive, including the instructor payment and third party insurance, is £170 per person. A deposit of £50 is required at the time of booking. See below for our booking enquiry form. Open for jumping Weekends & Bank Holiday Monday’s. Between April & October some Friday afternoons. Arrival times are 8am or midday. From November to February arrival times are 9am only. We will send out a text/email the day before saying either the jump is planned to go ahead or cancelled due to the weather. Sometimes the decision is not made until late afternoon or early evening the day before. On very rare occasions we have sent messages out on the day of the jump if the weather has changed drastically overnight. If you are booking accommodation the day before or after the jump bear in mind that this is a weather dependant sport and forecasts can change at short notice. Skydive Swansea is not responsible for your costs incurred if the jump is cancelled. You do not need to be an Olympic athlete to become a skydiver but there are limitations as regards to your weight – Ground Rush tandems are 16 stone for men and 13 stone for ladies. Regular tandems limits from 12000 feet are 15 stone for men and 13 stone for ladies(All weights fully clothed). There are TWO DIFFERENT TANDEM MEDICAL FORMS – 115A & 115B. EVERYONE has to fill out ONE of these medical forms. You may require a doctor to sign & stamp your form. Anyone aged 16 or 17 will require the signature of a parent or legal guardian if the 115A is required. EVERYONE has to fill out the BPA Application for Student Provisional Membership & Agreement Form. Anyone aged 16 or 17 will require the signature of a parent or legal guardian on this form. Visit our documents page to download copies of these forms from our website. This is a fantastic way to remember your skydive and a great way to see how you look in freefall, or to relive the experience with your friends and family. We have two different camera options. Gift vouchers are available. A great idea for birthdays/ anniversaries/ Christmas or even wedding presents. You will receive a gift card and envelope to give to the person who will be jumping. Please note that the gift voucher is valid for a year from the date of purchase. Why not see if it has already been covered in our list of frequently asked questions. For more information visit our FAQs page. To request the booking form & information pack add the details required below. You will be emailed straight away so please check your junk/spam folder in case it’s been sent there. The email explains how to book your jump. Remember if this is a gift for someone then please click this link GIFT VOUCHERS. When were you looking to jump? Please remember we cannot hold spaces until we have received the booking form and deposit. Once we have received these if there was a problem with the dates you have indicated on the booking form we would contact you. Please tick this box if you also require a paper version of the information pack to be posted to you in addition to the email copy. How many posted packs required? Parachuting does have an element of risk which you accept by signing the terms and conditions in the information pack and the Student training record sheet on the day of the jump. All staff ensure training is to the highest possible standard, with safety being the number one priority. 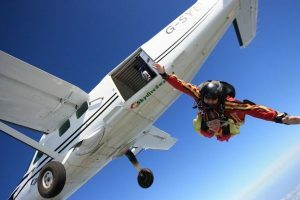 If any individual is considered not capable of undertaking the planned parachute descent, before or after training, the individual will not be allowed to complete the jump. We reserve the right to decline anyone we consider unsuitable to jump on the day, even if they are within the weight restrictions.